As week four marches along, we at Camp Pinebrook have been focused on our weekly value: teamwork. All week long counselors and staff have been emphasizing the importance of working together to achieve and accomplish, and campers have been seeing the value of partnership as they enjoy their daily activities, from cooking to buddy checks during swim sessions. We are so proud of the tremendous cooperation our campers engage in every day, and we are looking forward to showcasing the value of teamwork in our weekly Values Olympics tomorrow afternoon! After our whole camp participates in our weekly themed Olympics, taking part in activities ranging from incredibly silly to more athletic, we gather as a community for Oneg Shabbat. 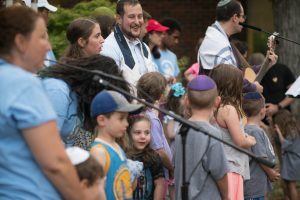 This is one of the highlights every week for campers and staff, as we sit together as a community to welcome the Sabbath and make blessings for candles, challah, and grape juice with the clergy from Temple Israel of New Rochelle. 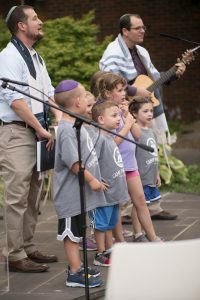 Rabbi Jesse shares a judaic story that thematically connects to the value explored during the week and everyone enjoys snacks and singing in the sunshine. Shabbat Shalom!